The dimples on a golf ball help it go farther. How golf balls are made depends on when the ball was made. Ancient early balls differed significantly from the three-piece and four-piece golf balls of the modern era. Modern balls must meet the specifications of the governing bodies of golf, the United States Golf Association and the R&A of St. Andrews, Scotland. Those specifications now match, but they didn't always. Between 1931 and 1988, the R&A sanctioned a ball size that was slightly smaller than that sanctioned by the USGA, meaning golfers played with a different-size ball in European events. The game of golf is defined by hitting a round object through a predetermined course into a hole. Scotland is credited with being the birthplace of the game. It's not possible to pinpoint the exact date golf was established, but the Scottish Parliament banned golf in 1457, indicating it was well-established by that time. However, hockey-like games were played even earlier with a club or paddle and a ball, stone or disk in France, Belgium and Holland. The stick was used to hit the ball towards a goal. Early golf balls in the 1400s were carved out of hard wood, and the game was played by all classes of people – from peasants to nobility – during that era. One of the first golf ball innovations came about in 1618. The "featherie" was a leather sack constructed of three pieces of leather sewn together and then stuffed with wet feathers, usually goose. When the feathers dried, they expanded and gave a rounded shape to the sack. The balls were then painted. The process was tedious, taking up to eight hours to stuff one ball. The balls didn't last long, either, because the leather was more fragile than wood. The advantage of the featherie was its superior flight ability. The innovation made golf a game for the rich, since the featheries were expensive and prone to damage. The game didn't get back to the common man until more than 200 years later, in the mid-1800s, when the gutta percha ball was invented from the newly discovered substance called rubber. "Gutties," as they were nicknamed, could be mass-produced by heating the rubber and pouring it into molds. The balls were hammered manually when it was discovered that the perfectly smooth balls didn't go as far when hit as did balls with small indentations. These indentations were the precursors of the dimples on modern golf balls. 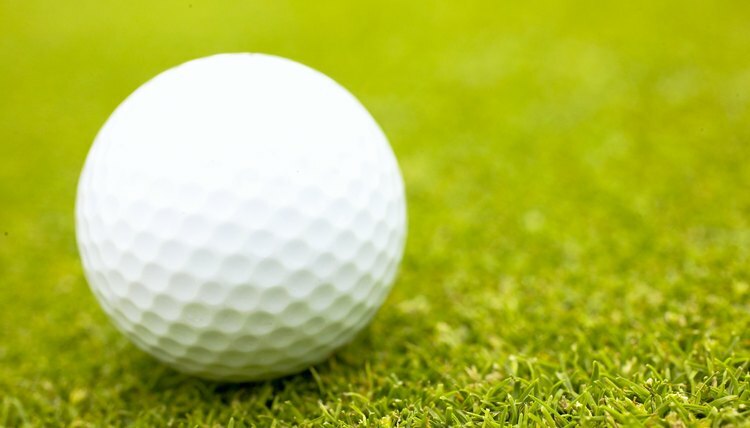 Natural and synthetic rubber remain the mainstay of the modern golf ball. The two-piece modern ball is formed by surrounding a spherical molded core made of rubber or synthetic rubber with a hard covering. The core is then placed in an injection mold. Hot plastic, either surlyn or urethane, is injected and forms a hard, dimpled coating around the core. The ball is painted, stamped with a logo, given a glossy coat and dried. Three-piece balls have a core center, a rubber covering of the core and a final coating. The rubber covering may be rubber string wrapped around the core. Four-piece balls have another covering over the first covering around the core that's not as hard as the final coating but not as soft as the rubber covering the core. The manufacturing process varies a bit in the exact composition and materials used, based on different manufacturers and whether the ball is made for distance or control.